Club Fajront is located near Brankov Bridge, across Museum of Contemporary Art, near former river club Lukas. 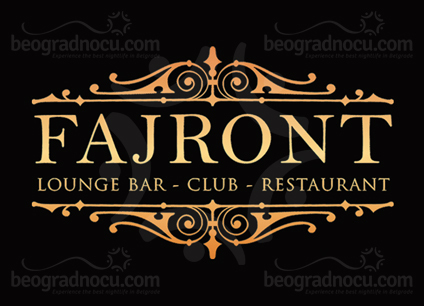 Belgrade’s night life has become enriched for another fancy club – club Fajront – with a motto ‘where our story begins’. Club Fajront represents mix of a lounge bar and popular nightlife. As a lounge bar club Fajront will be open seven days a week, and the focus will be on Italian recipes and first class wines. On weekends, precisely on Fridays and Saturdays from 11pm, this club will be transformed in a fancy night club. During this transformation, the interesting thing is that the interior of this club is adjusting according to fabulous clubbing, which is expecting you. As for the music, you can expect variations on house music, tech house, disco and funky sounds. You can expect interesting VJ shows with artistic performances as well. Along with the resident of the club Nenad Bucić, well know Dj in Belgrade clubbing, good party is guaranteed. Bucić will be bringing guests every weekend, a the first one are The Beatshakers. This Dj duo, has achieved world fame, along with cooperation with Dj Antoine on his most popular hit ‘Ma Cherie’. This YouTube video has over 40 million views. The second day of opening, Dj Marches will perform side by side with Nenad Bucić. You can expect a real jet set clubbing experience. The interion of club Fajront is very luxurious and as you enter you have a feeling that you entering in most fabulous club in Las Vegas. The whole interior has quality equipment whit hedonistic details. During a day, club Fajront will work as a restaurant where you can enjoy in amazing specialties of various food. As the day goes by, Fajront is transforming in exclusive club with special illumination, threatening to become one of the leaders in the area. Tables and chairs for dining, will be replaced with bar tables, VIP tables, booths by side and a central bar for top bartenders.